Drug therapy management is a key topic for all nurses caring for patients with a rheumatologic condition. With nurses now required to prescribe, administer, monitor and review medication, this volume will help nurses develop their knowledge, skills and self–confidence to provide these services, while also advising on the benefits and risks of medication. This much–awaited second edition has been revised to address the changing face of clinical practice and distinct advances in this field, providing vital information on the latest drug treatments such as biological agents that suppress the disease and initiate remission, it will also advise on the use of selective and non–steroidal inflammatory drugs. - Patient education and adherence to drug therapy. In addition, new material explores biologic therapies; management of non–steroidal drugs; nurse prescribing; management of chronic pain; and case studies to inform clinical decision–making regarding drug therapy. 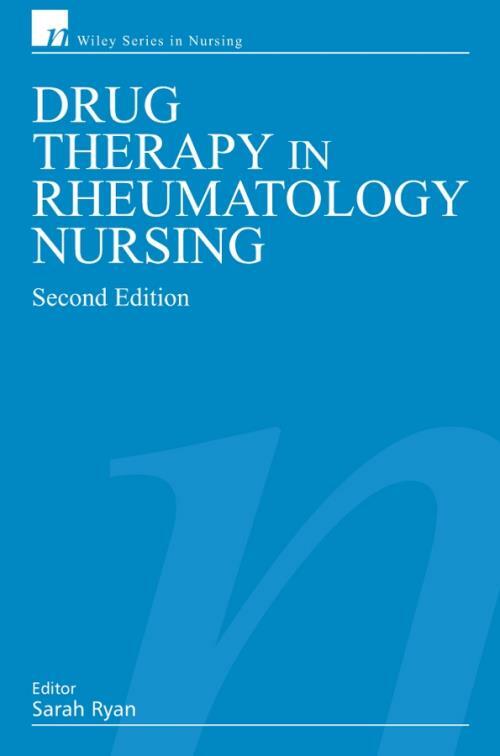 Drug Therapy in Rheumatology Nursing, Second Edition, is a useful tool for nurses, primary care nurses, student nurses and educators. It will also prove a valuable resource to other health professionals caring for patients with a rheumatologic condition, including pharmacists, physiotherapists and junior doctors. Chapter 1: Rheumatological Conditions (Janet Cushnaghan and Jackie McDowell). 1.1 Features of rheumatic conditions. 1.4 Anatomy and physiology of the musculoskeletal system. 1.4f) Tendon sheaths and bursae. 1.5 Anatomy and Physiology of the musculoskeletal system in inflammatory and non inflammatory arthritis. 1.6 An overview of rheumatological conditions most commonly encountered in Western Europe. 1.6d) Inflammatory arthritis associated with spondylitis. 1.7 The impact of the rheumatological conditions on physical, psychological, social and occupational function. 1.7a) Personal impact of RA. 1.7b) Financial impact of arthritis. 17.e) The role of social support. 17.f) Impact on family relationships. Chapter 2: Drug Therapy (Sarah Ryan, Susan Oliver and Ann Brownfield). 2.1c) Role of the brain. 2.1d) Physiological effects of acute pain. 2.2 Pharmacological interventions in rheumatology. 2.3 Disease Modifying Anti–rheumatic Drugs (DMARDs). 2.3a) Early treatment of RA. 2.3c) Mode of action and pharmacokinetics of DMARDs. 2.4c) Adverse reactions to biologic therapies. 2.4d) Biologic therapies treatment options. 2.4e) General Issues relating to the mode of action. 2.4f) Side effects for all anti–TNFs. 2.4g) Prescribing and breast feeding. 2.4 I) Specific information on TNF. 2.5 The use of steroids in the treatment of rheumatic disease. 2.5a) The use of steroids in rheumatoid arthritis. 2.5c) Adverse effect of corticosteroids. 2.5d) Use of corticosteroids in other rheumatological conditions. 2.5h) Reducing the dose of corticosteroid. 2.5k) Intra–articular injections of corticosteroid. 2.6 Disorders of purine metabolism. 2.8a) The case for self medication. 2.8b) Advantages of self medication. 2.8c) Stages in the implementation of self medication. Appendix 1: What happens next. Appendix 2: Guidelines for nurses on the use and administration on intra–articular injections. Appendix 3: Patient Group Direction for The Administration of Methylprednisolone Injection 40mg/ml by Intramuscular Injection. Chapter 3: The Role of the Nurse in Drug Therapy (Sarah Ryan and Margaret Ann Voyce). 3.1 What is rheumatology nursing? 3.1a) The nurse patient relationship. 3.3 The philosophy of rheumatology nursing. 3.4 The role of the nurse in drug therapy. 3.5 The commencement of DMARDs. 3.6c) Assessment of rheumatic disease activity. 3.8 Drugs that require surveillance. 3.11 The role of the community team in drug therapy. 3.12b) General practitioner concerns relating to practice based monitoring. 3.12c) Patients experience of drug monitoring. 3.15 Evaluation of community clinics. 3.15a) Potential problems with consultant based community clinic. 3.16 Nurse led community clinic. 3.17 New ways of utilising outpatient appointments. 3.18 Drug therapy and osteoporosis. 3.18b) Risk factors for osteoporosis fracture. 3.21 Drugs to reduce fracture risk. Appendix 1: Information sheet: The role of the rheumatology nurse specialist. Appendix 2: Guidelines for nurses on the use and administration of sodium aurothiomalate in rheumatoid arthritis. Chapter 4: Patient Education (Jackie Hill). 4.1 Definitions of patient education. 4.2 Useful theories and models. 4.2b) Stress and coping theory. 4.3 Purpose of patient education. 4.4 Limitation of patient education. 4.5 Role of the nurse in patient education. 4.5a) Patient education and some fundamental aspect of nursing. 4.5b) Patient education and therapeutic nursing. 4.6 Planning a patient education programme. 4.6g) The type of programme. 4.7a) Preferences of drug therapy. 4.7b) Assess the patient′s knowledge of drugs. 4.7d) Preferred method of information transfer. 4.7 f) The activity to be accomplished. 4.7g) The plan of action. 4.7h) Checking that the contract is realistic. 4.10 The Arthritis Self Management Programme. 4.11a) Teaching about drug therapy. 4.11c) Risk and adverse effects. 4.12b) The purpose of the material. 4.12e) Assessing the readability of the information. 4.12f) The cost of the exercise. 4.12g) The quality of the finished product. 4.13 The optimum timing of patient education. 4.14 Patient education and adherence. Appendix 1: Methotrexate Information Sheet.